Bridge House01263 715779work01603 870304fax Self-cateringThis charming 17th Century thatched cottage sits near the bank of the Glaven River. The property has plenty of character, retaining many original features with plenty of living space. Locally there is a good selection of pubs and restaurants and the Georgian town of Holt which is only a short distance away has many interesting shops and art galleries to explore. • Other: Bed linen, books and games provided. Very steep stairs with a twist so may not be suitable for guests with mobility restrictions or young children. • Outdoors: Cottage garden with patio, decking, furniture, stream and barbecue. Please note: Care should be taken with children near the unfenced stream. 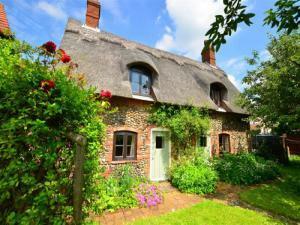 This charming 17th Century thatched cottage sits near the bank of the Glaven River. The property has plenty of character, retaining many original features with plenty of living space. Locally there is a good selection of pubs and restaurants and the Georgian town of Holt which is only a short distance away has many interesting shops and art galleries to explore.